Less frequently explored and photographed than its western neighbor Arizona, New Mexico is every bit as scenic, epic, and spectacular. Its high-desert landscapes and adobe architecture-inspired towns have greatly influenced the popular visual imagery of the Southwest and point to its Ancestral Pueblo culture roots. The highlands of the northwest feature the imposing Shiprock formation (a volcanic plug that played a major role in Navajo religion, myth, and tradition) and a series of absolutely moon-like badlands of eroded sandstone together named the Bisti/De-Na-Zin Wilderness. Passing through the ancient Anasazi dwellings of Chaco Culture and Gila Cliff Dwellings, photographers encounter the unbridled beauty of White Sands National Monument, the towering cliffs of the Organ Mountains, and the massive caves of Carlsbad Caverns National Park to the south. 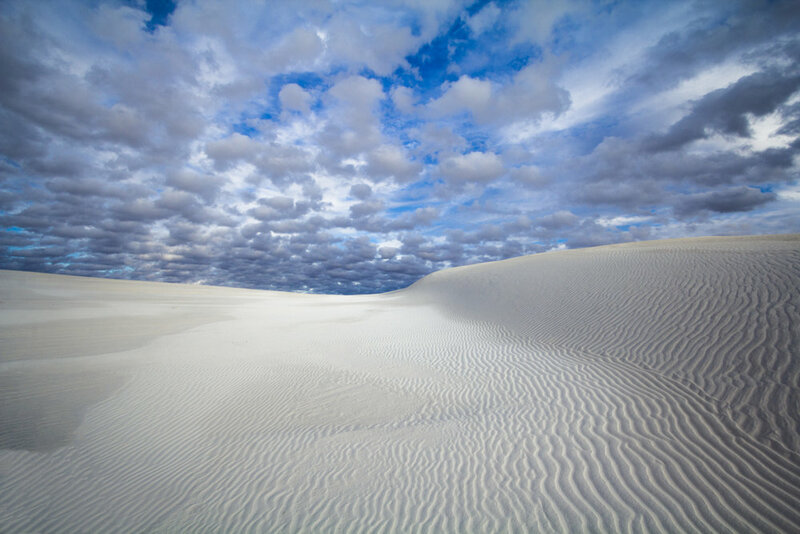 The appropriately named White Sands National Monument is a unique gem that contains the largest deposit of gypsum sand in the world. Its impossibly white sand stretches an estimated 145,344 acres - an eternity from some perspectives - and its dunes reach upwards of 60 feet high. The most interesting photographs combine the white landscape with yucca plants or other vegetation that somehow survives the choking encroachment of the sand. The best way to experience the park is to register for a backcountry pass, hike to the designated campsites in the wilderness, and witness its beauty during the golden hours. The stalactites and stalagmites in Carlsbad Caverns National Park are unrivaled throughout the region, and perhaps country. The “Big Room,“ which is as much as 4,000 feet long and as high as 350 feet, holds some of the largest examples, including the Rock of Ages (picture three), a massive stalagmite built over many centuries. The self-guided trail down into the various rooms starts at an impressive opening, where during summer months, visitors can watch more than a quarter million free-tailed bats swarm out during sunset. Around three miles of this trail weaves around the national park’s ancient underground formations, which only represents a fraction of the 30 miles (48 kilometers) mapped by scientists so far. Alien, exotic, martian, and often magical, the Bitsi Badlands area is one of the most deliriously fun places to explore and photograph. Part of the larger Bisti/De-Na-Zin Wilderness that is administered by the Bureau of Land Management, there are no official trails and very little signage so travelers are free to explore anywhere. There are so many hoodoos, desert spires, natural arches and fossils here that photographic possibilities are endless. In the far past, the Bitsi was a sea teeming with life but now, as dry land, the fossils and rocks deposited by the water are exposed. There are a few major landmarks in the Badlands, like the Egg Factory, Eagle’s Nest, Alien Woman, Manta Ray, The Wings, etc. but true to its wilderness designation, there is no indication as to where to find them. Because the landscape can look the same anywhere you turn, it’s advisable to navigate by following two main washes that both run east to west: the northern Hunter Wash and/or the southern Alamo/Gateway Wash.
An incredible view of the Rio Grande Gorge can be found across the Rio Grande Gorge Bridge 10 miles north of Taos. The gorge is part of the greater Río Grande del Norte National Monument of northern New Mexico. This national monument was designated in 2013 and is vast, remote, and barren. It protects the Taos Plateau volcanic field, which contains a series of moonlike sheet flows, cinder cones, and shield volcanoes. Typical of New Mexico’s high-desert, the landscape is frequently snowy and very cold during the winter months as it was during the sunrise pictured here. The bridge that traverses the gorge is a real engineering marvel. Spanning 1,273 feet, this a steel deck arch bridge rises approximately 650 feet above the river below. The communities of Native Americans that lived throughout the Southwest are collectively known as the Ancestral Puebloans or Anasazi. These people built entire villages out of stone, adobe mud, and other local material and their sites are scattered throughout the Four Corners region. However, no site is as large, dense, well preserved, and advanced as Chaco Culture. This ancient site is a vast collection of structures located in a remote canyon cut by the Chaco Wash. Residents occupied it between approximately 850 and 1250 CE. The buildings here are part of a great network of houses, worship centers, and other developments built with astronomical considerations in mind. Though the 21-mile drive to the dwellings is long, bumpy, and prone to wash outs, the sheer size of the site makes any visitation worthwhile. This historic pueblo was established in the late 13th and early 14th centuries in the valleys of the Rio Grande and is the oldest continuously inhabited community in what is now the United States. Its location, among the Taos mountains make it remarkably scenic, and historically the community benefited from serving as a central point of trade between the Rio Grande natives and Great Plains natives. Architecturally, its multi-story residential architecture is a shining example of peak pre-Columbian Ancestral Puebloan construction skills and technique. Click here for more Southwest Guides!